Consider the many factors why employees typically leave and take counter measures if you want to keep them. There is no question that the lifeblood of any organization is its employees. Unless you have a dedicated, well-trained and motivated team – whether in the public or private sector – there is no way to survive, let alone thrive. Although money is a factor, getting a raise in pay is rarely the only reason for an employee to leave. The fact is, there are a variety of other reasons that often have a larger influence on a worker seeking new horizons. In order to keep the best of your workforce from heading to the door, you need to understand some of the causes of employee turnover that are not related to money. When this article was written, in June of 2011, an emerging factor was the improvement of the economy as we came out of the depths of the recession. As a result of layoffs and cutbacks during the recession, many workers took jobs outside of their field of interest in order to feed their family. As opportunities open up, these individuals will naturally try to get their careers back into the area they find more interesting. Especially in the lower level positions in a sweeping company, it can be difficult to keep providing new challenges and experiences that will keep employees engaged in doing their work at a high level. Some employees also may have found that the work they are doing is simply not enjoyable on a long-term basis, and so will start looking for something else. There is also a generational gap between younger workers and older management that grows within the company at any given time. This can be especially true with the youngest generation currently in the marketplace, which are called the 'millennial's.' One hallmark of this group, generally speaking, is that when increased stress or busyness on the job starts affecting their home life or taking away time they can spend on their nonwork interests and hobbies, they start looking elsewhere. One of the biggest factors cited for leaving a current employer is an inability to get along with a person's direct supervisor. Time and again, this is one of the reasons that quality workers decide to leave. No matter what position an employee has in the company, managers must remember they need to develop a positive rapport based on respect in order to get the most productivity from anyone on their team. Another nonmonetary factor in employee longevity is whether or not they are provided with recognition of a job well done. This is especially true for top echelon workers. When someone goes above and beyond to provide excellent service, or works overtime, or brings in new customers it is vitally important that they be recognized for their efforts. Remember the very important adage "Censure in private and praise in front of everyone." Bob Nelson, author of the best-selling book "1001 Ways to Reward Employees," conducted a survey of 750 employees from various industries to assess corporate recognition practices. The top-ranking results were support, involvement and praise. Say it: "Thank you" becomes more than just an automatic response when you take the time to simply say it. Tell employees what they're doing well by using specific examples. Write a note: A handwritten card or letter means a lot, especially in the age of instant communication. Even if it is by e-mail, the recipient will be glad to get your message. Share it: Find the good and praise it in public. Open or close a staff meeting with recognition of a co-worker's special effort or outstanding project. Bring chocolate: Positive effects on brain chemistry make chocolate a good choice, but offering practically any treat shows goodwill. Share with the group or just refill your co-worker's candy dish while thanking him or her for a job well done. Leave a surprise: A latte and a sticky note left on someone's desk to praise a specific result can be a great way to start the morning. The cost of losing even a low-level employee can run as high as $10,000. I would suggest that it makes much more sense, and is in your best interest as an employer as well, to find ways to give credit to your employees on an ongoing basis. 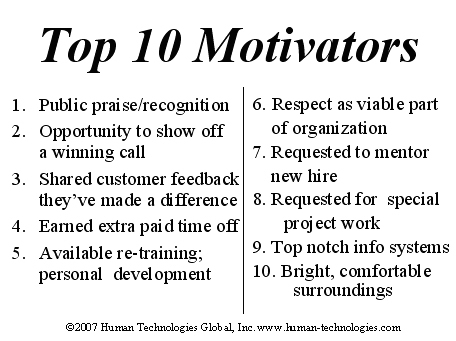 Find what works for you to motivate and retain your employees and develop an ongoing program to make sure your workers are kept satisfied. Want to take the right steps when an employee does leave? Here's an article that covers that specific topic. Ranger Kidwell-Ross is editor of WorldSweeper.com. He may be reached via this email link or by calling (866) 635-2205. This article was added to WorldSweeper.com in June of 2011.